Fatty acid of palmitic and stearic acids assembled on the HOPG and glass substrata (scale bar 1 µm). 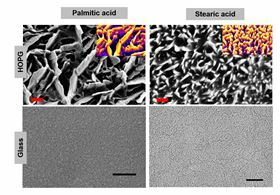 Bactericidal activity of the palmitic acid and stearic acid nanostructures against P. aeruginosa and S. aureus. 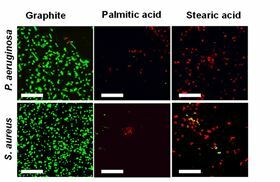 In the confocal laser scanning microscopy images, the green fluorescence indicates viable cells and the red fluorescence indicates lysed P. aeruginosa and S. aureus cells (scale bar 20 µm). Scanning electron micrographs (bottom) showing that cell morphology of P. aeruginosa and S. aureus is disrupted on palmitic and stearic acid microcrystallites but remains intact on HOPG substrata (scale bar 1 µm). The search for coating materials that can kill bacteria has turned to nature: to be precise, the wings of insects such as dragonflies and cicadas. The protective, waxy coating – or epicuticle – of insect wings is made up of a complex mixture of up to 50 different types of lipid molecule, which form a nanostructured arrangement. The surface features or topography of this thin layer wings can kill bacteria by interacting physically with cells and rupturing the cell wall or membrane. Ivanova, together with colleagues from RMIT University, the Australian Nuclear Science and Technology Organisation, and Universitat Rovira I Virgili in Spain, found that naturally occurring fatty acids, which are the major constituents of this outer wing coating, can be used to form a useful ‘mechanobactericidal’ coating for artificial surfaces [Ivanova et al., Acta Biomaterialia (2017), doi: 10.1016/j.actbio.2017.07.004]. 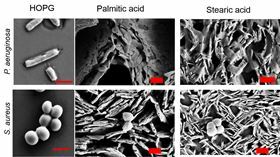 The researchers crystallized the two main ingredients of the coating layer – palmitic and stearic acid – on different surfaces via a simple one-step process. The fatty acids are first dissolved in chloroform, and then deposited onto highly ordered, smooth graphite (HOPG) films, before finally evaporating the chloroform. The fatty acids spontaneously arrange into microstructures on the graphite surface: palmitic acid forms sharp ridges, while stearic acid takes on a flatter, more undulating appearance. Although both coated graphite surfaces had a bactericidal effect on Pseudomonas aeruginosa and Staphylococcus aureus, which can cause serious complications in patients with existing medical conditions, the effectiveness of palmitic acid was more pronounced. After six hours, over 90% of the two bacterial strains were eliminated by the fatty acid coatings. Moreover, both palmitic and stearic acid are already FDA-approved as non-toxic additives for food, cosmetics and pharmaceuticals. “These microcrystalline surfaces could be effectively applied as single-use bactericidal nanocoatings in applications such as wound healing, wound dressing, and on scaffold materials,” Ivanova told Materials Today. Understanding the design principles of dragonfly wings could help improve the design of artificial wings on micro-air vehicles.